Alejandro Franceschi, MD, FACC,FSCAI, is board certified in internal medicine, cardiovascular disease and interventional cardiology. His specialties include consultative cardiology, coronary interventions, acute coronary syndrome, echocardiography and heart failure. A respected cardiologist with years of experience treating patients in Central Florida, he is a part of the esteemed cardiology team at AdventHealth Medical Group and provides consultations at the practice’s Orlando and Altamonte Springs locations. 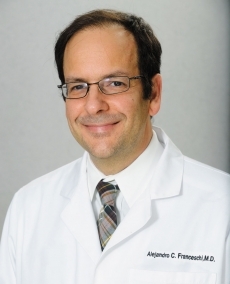 Dr.Franceschi is a fluent English and Spanish speaker who earned his medical degree at Autonomous University of Guadalajara, Mexico prior to undertaking back-to-back residencies in internal medicine and cardiovascular disease at San Juan Municipal Hospital and San Juan VA Medical Center in Puerto Rico, respectively. He then relocated to Florida for his advanced fellowship training in interventional cardiology at the University of Florida in Gainesville.